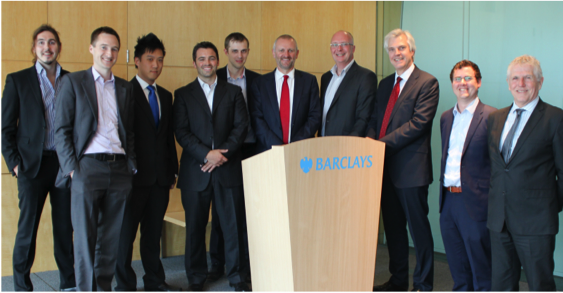 Innovative start-ups from the SETsquared partnership had a unique opportunity to pitch their technologies to one of the world’s leading banking institutions, Barclays, this month (July). Six companies from across SETsquared’s incubator programme were selected to showcase their innovative business propositions to a large group of senior business and technology directors at Barclays’ global headquarters at Canary Wharf in London. The opportunity is part of SETsquared’s Open Innovation programme, which aims to help corporate organisations access new technologies, solutions and innovations by brokering relationships with SETsquared’s start-up companies, researchers, innovators and entrepreneurs. It is a mutually beneficial partnership, with the corporates finding new technologies and products and the start-ups getting the chance to pitch to business giants they’d never usually be able to access. SETsquared and Barclays worked closely together to identify Barclays’ interests. The joint team then identified and selected a wide range of innovative companies across the SETsquared incubator programme that appealed to the bank. Through a series of rigorous reviews and presentations six candidates companies were selected to present at a prestigious event at Canary Wharf. Simon Bond, Innovation Director at SETsquared, said: “In the past there have been barriers to this kind of collaborative innovation, both on the side of the corporate and the start-up. Image above shows: Delegates at the event, including SETsquared’s Innovation Director Simon Bond and Adrian Cottington, Director of Technology Infrastructure and Services at Barclays.